There is a tried and true formula that has been used in Hollywood for many decades. Take a popular, older leading man, team him with a gorgeous young leading lady and mix them into a script that combines crime, drama and animal attraction. 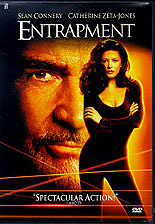 While this formula was done better in movies like To Catch a Thief, Entrapment is not a disappointment. There were many times I just could not believe the plot, there were plot holes big enough to park a Mack truck and several slow spots but I didnt care. The combination of Sean Connery and Catherine Zeta-Jones carries this movie. The plot, so to speak, is concerned with a master cat burglar, Mac, who, although is in his late sixties or early seventies, still the best around. Hot on his trail is an Gin an insurance investigator that is devoted to catch Mac. We soon find out that Gins job as an investigator is merely a cover to set up heists of her own. In a typical movie fashion Mac and Gin wind up in a distrustful partnership despite the difference in their ages. They are out to perform two robberies, a golden mask worth $40 million which is to be used to finance the real heist, $8 billion by means of computer fraud. The elder thief is so professional that he is able to resist his unbelievably gorgeous partner even though she seems to spend a lot of time naked in bed asleep or writhing around in skin tight outfits on the floor. While there are several good actors in this film, including Ving Rhames, the movie is almost completely centered on Connery and Ms. Zeta-Jones. They hold the complete attention of the viewer in every scene the are in. Sean Connery is the consummate professional, debonair, self controlled and poised in all occasions. He is still James Bond even after all these years. He is able to bring a touch of class to every role he takes. Much like his role in Highlander, he is the elder master, teaching a young apprentice the tricks of the trade. In this case his student is the younger thief played by Catherine Zeta-Jones. Zeta-Jones is the type of woman that is always noticed. In one scene she enters a fancy dress ball and all heads turn. I doubt it was necessary to give the extras instructions to do so. Zeta-Jones proves more than just beauty in this role. She is the feminist role model for thieves. Self assured, self-reliant but still intelligent enough to realize when she needs professional help. The chemistry between these two actors is perhaps the best that the screen has seen in many years. Now, as for the director, Jon Amiel, he has not had too much experience in taut drama, with the exception of Copycat, but he generally does a good job here. Casting the leads almost guaranteed success but there is more required in making a film. Amiel uses some fantastic locations that help provide the type of international feeling To Catch a Thief had. While the plot plods along at times the pacing seems overall to work. If Amiel had made Entrapment as tight as Copycat or provided a script as well written then this could have been an exceptional movie. Instead it remains an entertaining film that succeeds in spite of its flaws. The DVD is excellent. The many explosions, storms and the like provide good exposure for the Dolby 5.1 sound track. The many night scenes are without defect and clear. The only down side is the lack of extras on the disc. Grab some popcorn, turn up the sound, turn down the lights and enjoy the performances and ignore the flaws. This is a movie for good old fashion entertainment.